Almost two months since his departure, Delvin Breaux continues to cast a huge shadow over the Hamilton Tiger-Cats' secondary. In just two seasons, the six-foot-one, 196-pound Breaux established himself as one of the CFL's top cornerbacks. Not only was Breaux big enough to be a physical player but he also had the speed and tenacity to cover an opponent's top receiver by himself. That allowed the Ticats to double-team another pass catcher or blitz a linebacker safe in the knowledge that Breaux's area was locked down. Breaux was a CFL all-star last year with 33 tackles, five pass breakups and three forced fumbles. He also recorded his first career interception, returning it 27 yards for a touchdown. The one pick wasn't indicative of Breaux's ball-hawking ability. Many teams usually avoided throwing the ball his way. And the NFL took notice. Breaux worked out for 13 teams in the U.S. before signing with his home-town New Orleans Saints in January. Hamilton afforded Beaux that opportunity by releasing him beforehand. "Filling those shoes will be hard for the Ticats," a league source said. "Talent-wise he's the kind of cornerback that our league gets one or two of every five-to-10 years." Breaux's story is a heady one considering the 25-year-old suffered a near-fatal broken neck in '06 covering a kick during a high school game in New Orleans. Breaux had committed to play at LSU before the injury and while he ended up attending the school, he never received medical clearance to play football for the Tigers. Breaux was with the Arena Football League's New Orleans Voodoo when discovered by the Ticats. Hamilton has six experienced defenders on its roster who've played either halfback or cornerback — Americans Brandon Stewart, Rico Murray, Emmanuel Davis, Ed Gainey and Michael Coe as well as Canadian Courtney Stephen. But it's hard to imagine the Ticats' hitting the jackpot a second time and finding another player with Breaux's unique skillset. The six-foot, 194-pound Stephen, a native of Brampton, Ont., was Hamilton's other starting cornerback in last year's 20-16 Grey Cup loss to Calgary. The second-year pro had 46 tackles and two interceptions for the Ticats. Stewart and Murray (tied for second in CFL with five interceptions) were both regular starters for Hamilton. 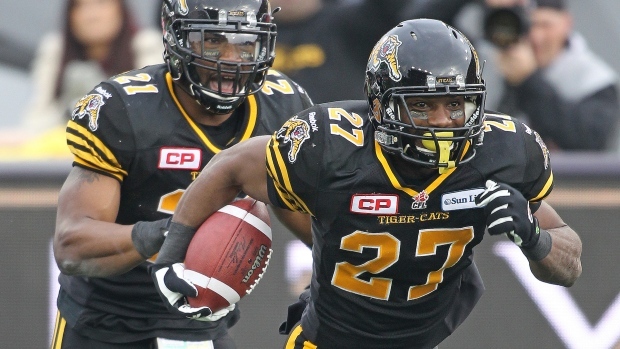 Davis has been in the Ticats' starting lineup several times over the last two seasons and could take on a larger role in 2015. So, too, could Coe and Gainey. Coe is a seven-year NFL veteran and played well early last year before being injured and missing most of the season. Gainey, a former Montreal Alouette, joined the Ticats late last year and was an effective player during the club's stretch run. While the loss of Breaux is huge, the Ticats scouting department under head coach/GM Kent Austin has managed to find quality players. Only six Ticats remain from the squad Austin inherited in December 2012 and Hamilton has reached the Grey Cup in each of the last two seasons on Austin's watch. Austin wasn't immediately available for comment Thursday. "Hamilton has brought in a lot of new players to the league who've become impact players: Breaux, (receiver/returner) Brandon Banks, (running back) CJ Gable, (defensive lineman) Eric Norwood and (receiver) Luke Tasker to name a few," the source said. "Yeah, they could trade for an experienced corner, but they're more likely to try to replace Breaux the same way they've built their team — with a young guy. "Right now, they have close to 10 defensive backs on their negotiation list so that might be where their answer comes from."